if you have a paint finish like this, you have likely thought youre paint is far beyond repair, the truth is, it is possible to at least improve, if not completely repair your paints finish. clean surface of debris and dirt, begin sanding with water with 800 grit, continue to 1200 grit, wiping the surface clean between grits. finish with 2000 grit, you should notice that most, if not all of the clearcoat residue has been removed. apply compound to buffer, start on the flat upper surfaces and work your way down, wipe clean, then continue on to use the polish, mix 50/50 with wax, id use a higher speed on the buffer, around 1800-200 rpm, be careful not to use too much pressure or to stay on one part of the paint for too long, as you may burn the paint. 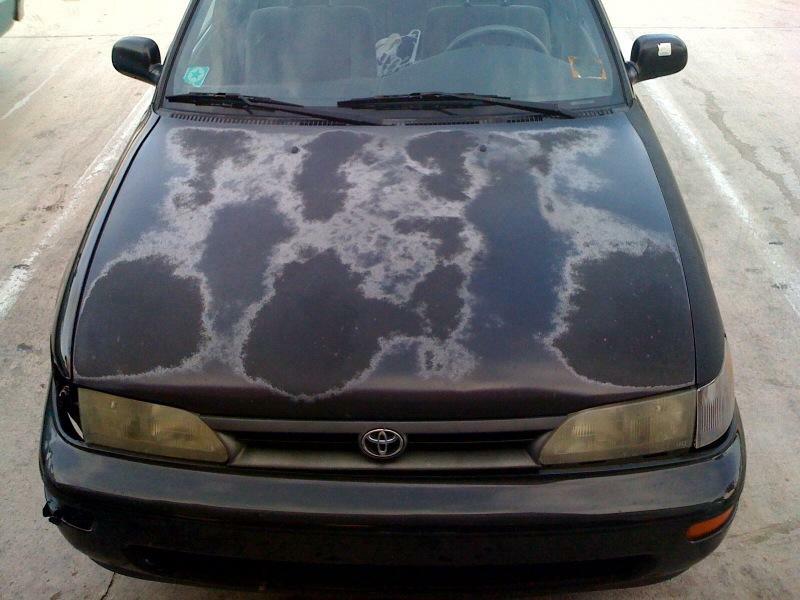 at the VERY LEAST your finish should have a considerable shine. with a little maintenance, your finish should last for quite some time. I'd think you might be able to sand and clear it again. Maybe to far gone as in the the pigment is gone. I'd love to see some before and after pics if you can get some of a project in the future or even one you've done already. ill try to score a busted looking hood from the yard to practice on, i havent done this first hand actually.